Teachers will attend to the minor superficial injuries at school. In the event of the teacher considering it necessary, your child will be transported by car to Northampton Hospital for treatment. In cases of suspected serious injury an ambulance will be called with parents being liable for the costs incurred. A number of regulations have been drawn up by the Health Department on the premise that children who have been ill with an infectious disease will not return to school until they have fully recovered. The only exception to this rule is that children with certain skin diseases may return once appropriate treatment has commenced. CHICKEN POX – Exclude for at least 5 days after rash appears and until all vesicles have crusted. MUMPS – Exclude for 9 days after onset of symptoms. RUBELLA – Exclude for 4 days after the onset of rash. MEASLES – Exclude for 4 days after the onset of the rash. VIRAL HEPATITIS – Exclude for at least one week after onset of jaundice or two weeks after onset of symptoms. WHOOPING COUGH – Exclude until 5 days after an appropriate antibiotic treatment, or for 21 days from the onset of coughing. RINGWORM – Exclude until person has received antifungal treatment for 24 hours. SCABIES – Exclude until the day after treatment has commenced. PEDICULOSIS/LICE – Exclude until after treatment has commenced and live lice removed. CONJUNCTIVITIS – Exclude until discharge from eyes has ceased. IMPETIGO/SCHOOL SORES – Exclude for 24 hours after antibiotic treatment has commenced. Lesions on exposed skin surfaces should be covered with a waterproof dressing. HAND, FOOT AND MOUTH DISEASE – Exclude until vesicles have formed crusts that are dry. DIARRHOEA – Exclude until 24 hours after diarrhoea has ceased. COLD SORES – Young children unable to comply with good oral hygiene practices should be excluded if lesions are uncovered and weeping. MENINGOCOCCAL DISEASE – Exclude until antibiotic treatment has been completed. Download the How to deal with a dispute or complaint in a Catholic School. If you are in the classroom or school grounds during an emergency please follow the teacher as they activate their Emergency Plan which is visible on the inside door of all buildings. The Assembly Area for all staff and students is the grassed area in front of St Mary’s Church. In keeping with Catholic Education Commission WA and Education Department Policy we do NOT give ANY medication to students without the written permission of Parents/Guardians. To safeguard the children from the harmful effects of solar radiation we have a No Hat = No Play policy throughout the year. Children are restricted from playing in the sun if they are not wearing a suitable hat. Download the Standard Collection Notice. Our school is serviced during school hours by the Dental Health Clinic (situated at Bluff Point Primary School. Ph 9923 1289). If children are not well they should not be sent to school. In the case of a serious accident or illness at school, you will be contacted to collect the child. 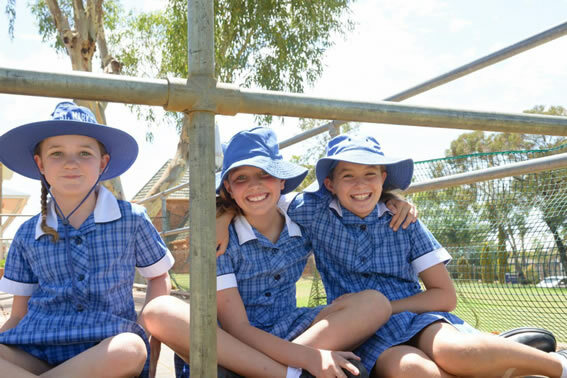 At St Mary’s School, our uniform is a sign of our community and it reflects the school vision statement and goals. All families sign, as part of the confirmation of enrolment, a consent form supporting the uniform and grooming requirements of our school. It is the responsibility of all parents to ensure that students are attired in correct, well fitting, complete school uniform. Uniforms must be in good condition and repair. Current uniform is to be worn therefore during school hours and to and from school. If there are circumstances that cause difficulty in attending to the request, please contact the school immediately and make an appointment to see the Principal. During ‘Free Dress’ days, students are not permitted to wear unacceptable items of clothing, clothing with unacceptable slogans or messages, inappropriate footwear and/or unacceptable hair styles. If students and parents choose not to follow the school’s dress code policy, the Principal may choose to withdraw the child from the class and/or school events. The student will not be permitted to attend these events until the issue has been resolved and the student and parents support the school in following the school policy. to develop a sense of student unity, pride and loyalty to our school and to its vision. to de-emphasise differences in appearance. to focus on the real purpose of schooling i.e. the development of an individuality of intellect, imagination and personality. Staff members conduct a daily check of uniform standards. A uniform note will be sent home should there be an digression from the school’s dress code. Please download a copy of the uniform note here. If some accident or difficulty prevents children from wearing full uniform on any particular day, parents are required to send a note of explanation to the child’s class teacher. Click here to view the a list of the uniform requirements and their price here.